This article is about a plant with the Japanese name Rakkyo. For the film series, see Kara no Kyoukai. 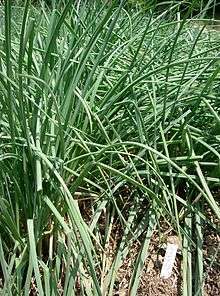 Allium chinense (commonly known as, variously Chinese onion, Chinese scallion, Japanese scallion, Kiangsi scallion, and Oriental onion) is an edible species of onion, native to China and cultivated in many other countries. It is known by these other names in other languages: in Japanese: ラッキョウ (rakkyō), also written as 辣韮, 辣韭, or 薤; in Chinese: Simplified/Traditional: 薤/薤 (xiè) or 荞头/蕎頭 (qiáo tóu); in Vietnamese: củ kiệu. Allium chinense is native to China (in Anhui, Fujian, Guangdong, Guangxi, Guizhou, Hainan, Henan, Hubei, Hunan, Jiangxi, and Zhejiang provinces) plus in areas where it is also deliberately planted. It is naturalized in other parts of Asia as well as in North America. Owing to its very mild and "fresh" taste A. chinense is often pickled and served as a side dish in Japan and Vietnam, to balance the stronger flavor of some other component in a meal. For example, in Japanese cuisine it is eaten with Japanese curry as a garnish. In Vietnam, pickled A. chinense is often served during Tết (Vietnamese New Year). Allium chinense is used as a folk medicine in tonics to help the intestines, and as a stomachic. 1 2 "Allium chinense". World Checklist of Selected Plant Families. Royal Botanic Gardens, Kew. Retrieved 2013-05-28. 1 2 3 4 5 GRIN (May 12, 2011). "Allium chinense information from NPGS/GRIN". Taxonomy for Plants. National Germplasm Resources Laboratory, Beltsville, Maryland: USDA, ARS, National Genetic Resources Program. 1 2 Multilingual Multiscript Plant Name Database: Allium. University of Melbourne. Updated 3 August 2013. Retrieved 5 September 2014. ↑ Flora of China Vol. 24 Page 196 藠头 jiao tou Allium chinense G. Don, Mem. Wern. Nat. Hist. Soc. 6: 83. 1827. ↑ James A. Duke. "Allium chinense (LILIACEAE)". Dr. Duke's Phytochemical and Ethnobotanical Databases. Retrieved 2011-05-13.